One area that remains unclear is how nitrate losses will be reliably measured to monitor and enforce these limits. Current approaches are principally based on modelling, rather than direct measurement of nitrate losses, as options such as regular physical sampling or real-time sensors are too expensive to be scalable. 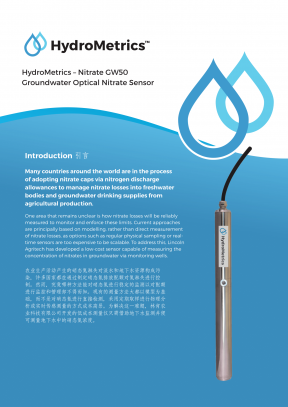 To address this, Lincoln Agritech has developed a low-cost sensor capable of measuring the concentration of nitrates in groundwater via monitoring wells. Groundwater deployment to measure nitrate nitrogen concentrations. Deployment in low ionic strength groundwater means organic carbon or chloride interferences are minimal. Designed to allow installation in 50 mm wells. These are often able to be installed by low cost direct push technologies, reducing the overall installation cost. Remote data-logging capability for real-time data. A fit for purpose Nitrate Sensor at a low price point that enables feasible deployment across multiple sites at the catchment or farm scale. Low power consumption (solar power installation possible). The sensor utilises optical sensor technology to extend the service interval when compared to other lower cost technologies such as Ion Selective Electrodes, which often suffer from significant calibration drift. This makes Lincoln Agritech’s optical sensor more suitable for long term unattended deployment. Periodic cleaning rather than calibration required, reducing ongoing maintenance. Continuous monitoring as opposed to laboratory analysis is rapidly growing within the agricultural community due to increased data frequency. Modern communication systems allow data to be accessed in real-time with no delays. The Hydrometric Sensors can be connected to a wide range of communication devices to make accessing the data very simple. It is easy to make the information available to people who require it via servers or internet websites. Manual downloading or laboratory processing is expensive and time consuming. The HydroMetrics sensor is distributed and supported by companies including Lincoln Agritech Limited and Aquamonix. The HydroMetrics sensor has been designed and developed by hydrogeologists and engineers at Lincoln Agritech Limited. Established in 1964, Lincoln Agritech is a multidisciplinary research and development company owned by Lincoln University. The company delivers leading-edge science and engineering for the environment, agriculture and industry. Examples of our research projects and technologies can be found throughout New Zealand and internationally. 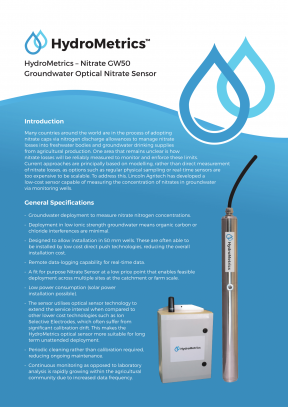 The HydroMetrics sensor is distributed and supported in Australia by Aquamonix. Aquamonix is an Australian business that specialises in the manufacture and supply of instrumentation and solutions for the water industry. The company has manufacturing facilities located in Queensland, Western Australia and Milperra, New South Wales with National Association Testing Authorities (NATA) accreditation. Aquamonix specialise in environmental solutions and irrigation monitoring and have sales and operational staff in Victoria and South Australia.